Dairycon 2005 to 2008 PreReg Exclusives! This section details the four characters available as PreReg exclusives (the free one you got just for showing up) for the 2005 thru 2008 conventions (one per year for four years). They are presented here together because they share something very special in-common: namely, a certain large nameless corporation likes to 'borrow' them and add them to their Mini-Con multipacks. 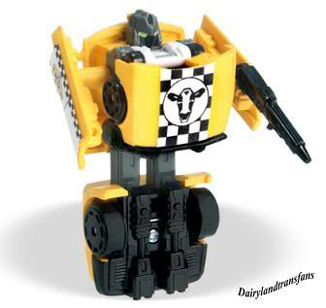 :-) OK, that's not the only reason, but they have borrowed Flatfoot and Checkers...at least this way, if they want to recolor the Mini-Con (get it- Mini Con?) two more times, they can easily look here. Quote: "Dirty Deeds, Done Dirt Cheap!" 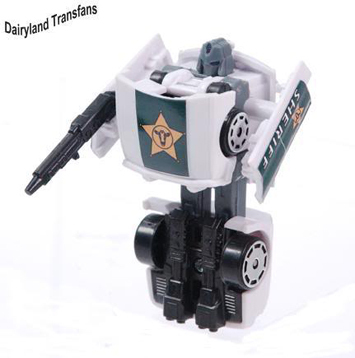 A career criminal on Cybertron, BAILJUMPER was inadvertantly reformatted into a police car upon his reactivation on Earth. Due to the Autobots' trust of human police forces, he has found it astonishlingly easy to infiltrate high security areas to steal technology and information. Has a personal vendetta to settle with the Autobot leader Thunderclash. Suspected of being sent by Jhiaxus to scout Earth for terraforming. BAILJUMPER is a master criminal and thief. He is able to pick any lock using the various lockpicks contained in his fingertips. The soles of his feet are cushioned, silencing his footsteps. He can adjust his heat signature to match his surroundings, evading infrared detection, and can cause lasers to warp around him without disruption. Tends to rely too much on his tools, and not enough on his intelligence. His vehicle mode tends to attract attention outside of the Western and Continental Americas. 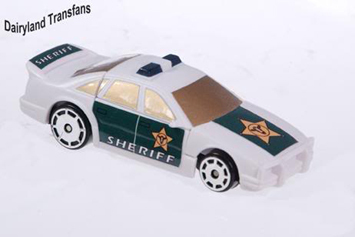 Notes: we thought of this evil police car idea long before the '07 movie and bayformers :-) Hmmm, great minds think alike, or total ripoff? You decide! Quote: "Thank you for your Cooperation!" "Freeze, lawbreaker!" are usually the first words out of Flatfoot's mouth. A no-nonsense, strictly by-the-book fellow. Has the entire Cybertonain Codex committed to memory. A true law-man's law-man. Despite this, Flatfoot is, by all accounts, an enigma. 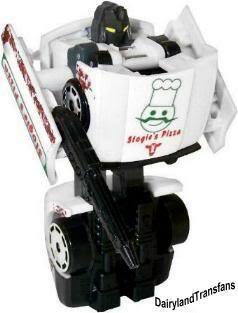 He is one of the very few Transformers who hates change. This can most likely be attributed to his forced 'transformation' from a vehicle alt mode (a changeform style which, ironically, was stolen by Bailjumper to commit crimes at The Leader's discretion) to his current Beast form. Refusing further change until his vehicle form is restored, Flatfoot prefers to remain in his animal mode. 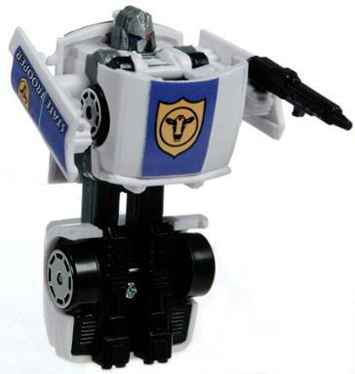 As a former Autobot Patrolman (and rumored member of the Cobalt Sentries) he continues to serve the cause and protect in his role as advisor to Bunny Convoy, offering advice and wisdom when needed. Unflappable calm. When others lose their way, Flatfoot is there to steer them back in the right direction. Commands respect in any situation. Sensors pick up the weakest radio transmission. Constantly tuned in to the police bands so that he can rapidly deploy to the trouble spots. In vehicle mode, lights and sirens cause disorientation in his enemies. Armed with a semi-automatic laser pistol and a CO2 shotgun. 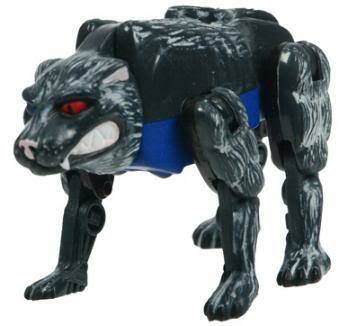 In beast-mode, sensors allow him unprecedented ability to track his opponents. Eyes can fire 9mm lazer bullets. In robot-mode, equipped with an electromagnetic shield, and energon-cuffs. Sometimes overlooks the big picture in his efforts to enforce the smallest rule. Easily upset by human youth, especially in their wild defiance of any authority. Has been vandalized more than once while giving a lecture to inner-city ruffians. He once stopped mid-speech to find that he was up on blocks with his engine and tires missing. Flatfoot doesn't feel he can best serve the cause in his current beast configuration. He longs for his previous vehicle-mode. Is resentful for having been maximized; this interferes with his normally even-handed judgement. Quote: "I like Mankind just fine; it's people I don't trust." CHECKERS signed up with the Autobot army to travel to strange new worlds and seek out new life. He ended up stuck in major American cities watching for Decepticon activity. To quench his boredom, he began listening to right-wing political talk-radio. He found kindred spirits in the hosts, even though some of their views can border on the extreme. 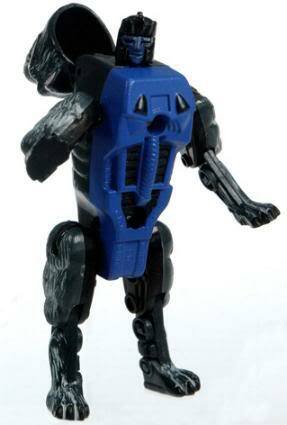 Some Autobots (BEACHCOMBER, for example) cannot even stand to be assigned with him due to his right-wing leanings. Openly campaigns for political candidates by attaching ads to his vehicle-mode roof. Dislikes being assigned to Milwaukee, and absolutely refuses to operate in Madison. CHECKERS can monitor all radio, infrared, and microwave frequencies, including secret police and military channels. 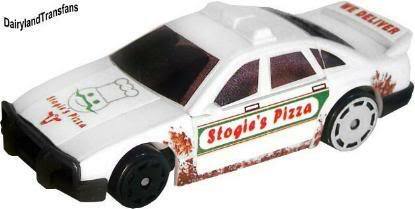 While his vehicle form isn't particularly fast or durable, it is dependable. With regular maintenance, he is virtually immune to breakdowns. Sometimes takes his political views to the extreme. His roof light is permanently stuck in the "off duty" position. Notes: I can think of at least two people that this chracter reminds me of... :-) Isn't it great? Come on! A taxi-cab that sounds like Archie Bunker? Hello? Anyone? We even gave you a Breakdown joke, fer cryin' out loud! Quote: "Cross me and you'' be sleepin wit da fishes!" but long on brute force, he'll whack ya just for lookin at him Crosswise. Not too creative, but utterly loyal to his boss and his "boys". Domino is fairly tough and strong. Carries a "Heartburner" gun that chemically converts his enemy's fuel into a highly corrosive acid that burns them up from the inside out. Vehicle mode blends into an urban environment with ease. DOMINO is a bull in a china shop. The word "delicate" is not in his vocabulary. He often uses brute force when a more refined approach would work better. Notes: I'm sure I don't have to spell out the nefarious cheese mafia that inhabits this state. You think I'm joking.